Width: 13.5" Height: 14.7" Depth: 12.6"
The double-sided XID 83AB retransfer printer was developed for the financial market. It delivers the right combination of reliability, performance, and affordability for printing durable and secure cards. Produce high-quality images on financial cards, including the uneven surface of a smart card. 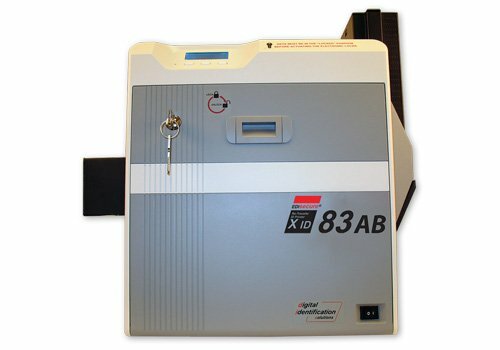 The XID 83AB supports a variety of card materials. 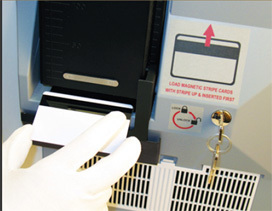 Lockable, high-capacity card hopper stores up to 200 blank cards. 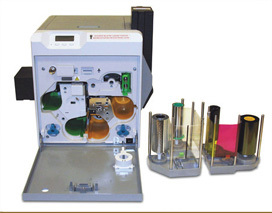 User-friendly, front-loading system, with replaceable cartridges, makes changing supplies fast and easy. Magnetic stripe and EMV smart card encoding is included as standard.